Bring 3 liters of water to a rolling boil, with 1 tablespoon of salt. Cook spaghetti to al dente, approximately 10 to 12 minutes. Heat the extra virgin olive oil in a sauté pan. Add the chopped garlic, let it cook until golden in colour. Add crushed cherry tomato halves to the sauté pan, season with 1 teaspoon of salt. Let it cook on high temperature for 4 to 5 minutes. 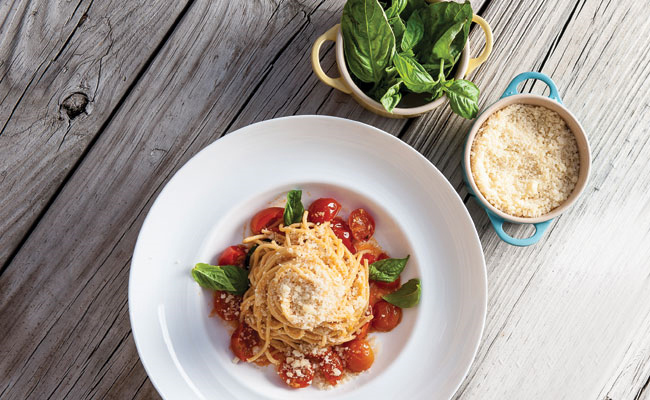 Toss the pasta together, add fresh basil and serve with parmesan cheese.